Background Autosomal-dominant polycystic kidney disease (ADPKD) is the leading inherited renal disease worldwide. 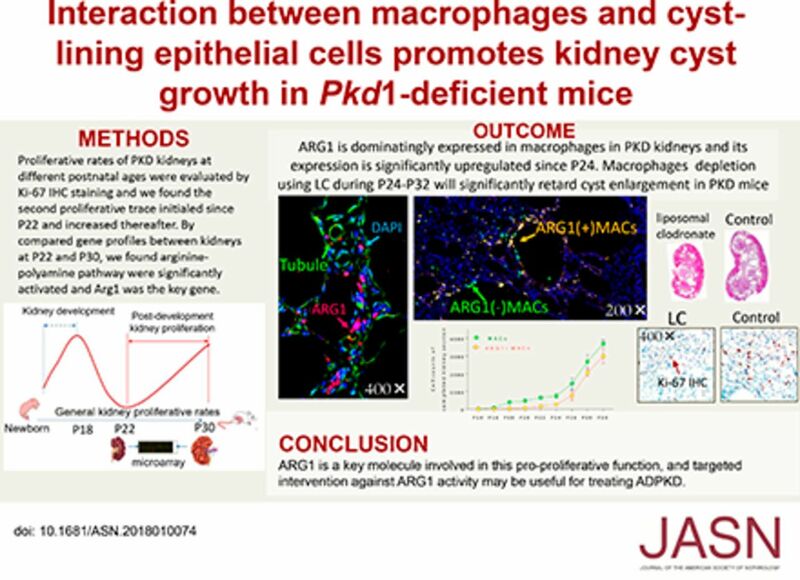 The proproliferative function of macrophages is associated with late-stage cyst enlargement in mice with PKD; however, the way in which macrophages act on cyst-lining epithelial cells (CLECs) has not been well elucidated. Methods We generated a rapid-onset PKD mouse model by inactivating Pkd1 on postnatal day 10 (P10) and compared cell proliferation and differential gene expression in kidney tissues of the PKD mice and wild-type (WT) littermates. Results The cystic phenotype was dominant from P18. A distinct peak in cell proliferation in polycystic kidneys during P22–P30 was closely related to late-stage cyst growth. Comparisons of gene expression profiles in kidney tissues at P22 and P30 in PKD and WT mice revealed that arginine metabolism was significantly activated; 204 differentially expressed genes (DEGs), including Arg1, an arginine metabolism–associated gene, were identified in late-stage polycystic kidneys. The Arg1-encoded protein, arginase-1 (ARG1), was predominantly expressed in macrophages in a time-dependent manner. Multiple-stage macrophage depletion verified that macrophages expressing high ARG1 levels accounted for late-stage cyst enlargement, and inhibiting ARG1 activity significantly retarded cyst growth and effectively lowered the proliferative indices in polycystic kidneys. In vitro experiments revealed that macrophages stimulated CLEC proliferation, and that L–lactic acid, primarily generated by CLECs, significantly upregulated ARG1 expression and increased polyamine synthesis in macrophages. Conclusions Interactions between macrophages and CLECs promote cyst growth. ARG1 is a key molecule involved in this process and is a potential therapeutic target to help delay ADPKD progression.